--There is no body. The remains of Bin Laden’s body were reportedly “buried at sea” in keeping with "Islamic rules." But why would people who live in a desert environment have rules establishing disposal of bodies by burial at sea? The official explaination was that Islamic law required burial within two days. Due the the secrecy and because there was no approved place to bury him, the decision was made to bury the body at sea. --The assault that led to the fatal shooting of Bin Laden was carried out by special forces operating without the knowledge of the Pakistan military, stationed only a few yards away. Is there anything wrong with this story? Why didn't Pakistani forces know his whereabouts and if they did, why was it kept secret? --A military helicopter crashed and burned on the site of the killing, thus possibly destroying physical evidence that such an event occurred. That no Americans were killed in the attack suggests that the helicopter crash may have been staged. --Pictures of Bin Laden’s bloodied and shattered face were broadcast on Pakistani television, although their authenticity could not be verified. There was pressure on U. S. forces to make the photos public to prove that Bin Laden was really dead. Yet such images could have been easily produced with the help of computerized technology like Photoshop. --We have only President Barack Obama's word and the word of key military leaders who allegedly watched the assault on closed circuit television that Bin Laden is dead. While admittedly gory to consider, would it hot have been more convincing to have produced Bin Laden's body, or at least his head on a platter at Ground Zero? --The timing of the alleged killing of the world’s most “wanted” terrorist, the so-called mastermind of the 9-11 attacks on the United States occurred just prior to the 2012 presidential election campaign. That such a commando raid is possible, and that U. S. forces may or may not have used such an attack to seek out and kill the man associated with the worst attack on American soil in modern history, suggests that all of the bloodshed that followed the 2001 attack was unnecessary. Bin Laden’s role in the 9-11 attack was known to our military within hours of the attack. At the time even his whereabouts along with a band of co-conspirators in the Afghan City of Kandahar, also was known. The proper way to resolve this conflict was to have utilized an immediate commando raid, seize the alleged culprits and deal with them. Such an act would have brought a swift conclusion to the so-called endless “war on terrorism” and shown the world that such an attack on America would result in quick and fierce consequences. Instead of this, the Bush Administration chose to send the full force of our military in to attack the entire nation of Afghanistan, and later the nation of Iraq without just cause. Bin Laden and his band of Al Qaeda extremists never operated within national borders. Since their success with 9-11, Al Qaeda has expanded operations throughout the world. The death of Bin Laden after Bush left office no longer carried the weight it would have if US commandos had pounced on him within days or even weeks after he struck us. 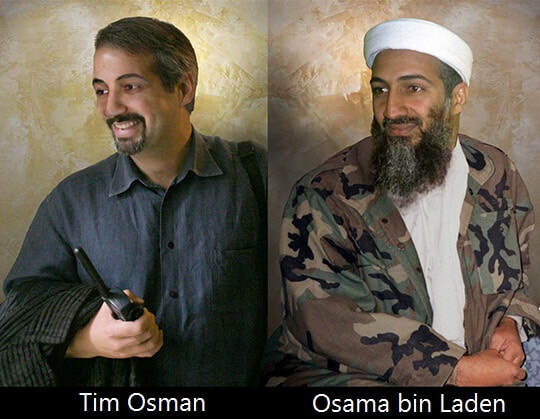 It is interesting to note that since that historic event a report by Alexander Light in HumansAreFree.com offered an extensive story of how the identity of Osama bin Laden was always a creation of the CIA, that the man was really an operative named Tim Osman. In fact the Light story suggests that the entire al Queda network was a CIA invention designed to give US forces an enemy to chase in the Middle East. And then a book by David Ray Griffin, former emeritus professor at Claremont School of Theology, California, titled "Osama Bin Laden: Dead of Alive?" claims that Bin Laden died of kidney failure on December 13, 2001 and that his body now lies in an unmarked grave in Afghanistan's Tora Bora mountains. Griffin insists that the Bin Laden tapes made after the 9-11 event were manufactured by the West to make everybody believe Bin Laden was alive and give cause for the Bush war on terror. So did our forces really kill Bin Laden or is this all another political twist to the human reality matrix? Once the excitement is over, we have to admit, the story has all of the ingredients of another American conspiracy theory, a spin-off of the 9-11 conspiracy theories, in the historical record.